Warr, D., Guillemin, M., Cox, S. M., & Waycott, J. (eds) (2016). 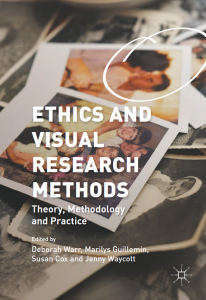 Ethics for Visual Research: Theory, Methodology, and Practice. London: Palgrave MacMillan. Deborah Warr, Jenny Waycott, Marilys Guillemin and Susan Cox. Photo acknowledgement: Amy Spiers and Catherine Ryan, Nothing To See Here (Dispersal), 2014. Photographer: John Possemato.